← Mother of the Year Award: I’m Not Gonna Get It and I Don’t Care. Getting a Little, Giving a Little. In the spirit of Blogger Karma (my new found religion, I swear to you), it’s important I “blog it forward” a bit right now. So bear with me, I’ve got two bits of bloggng karma work to do. First of all, the wonderful Florinda decided to give me my first bloggy award. Deep blushes and deepest of thanks. Now I will admit that I (still a wee novice blogger waiting for her copy of Blogging For Dummies to arrive) am still not sure how to get that award pasted onto my home page (and if anyone knows, give me a shout-out). BUT! At least it’s posted above and I can at least do the rest. Put the logo on your blog (see above). Add a link to the person who awarded you (it’s in this post – see above). Nominate at least seven other blogs (see below). Add links to those blogs on your blog (done in the nominations). Leave a message for your nominee on his or her blog (to be done as soon as this post goes up, so I can leave the link too!). I decided to nominate women who are talented bloggers but also just “good people”. 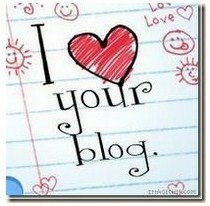 These bloggers may not live a blogger’s “Dooce“-like high life, but they are 100% worthy of some good blogger karma. Here are my choices, in no particular order. 1) Art, Like Bread: Cami has created a wonderful blog about crafting in her daily life. She lives in Mexico and has endless amounts of inspiration around her. Her easy, approachable, “even us regular folk can be crafty” style is very much appreciated and inspirational. I read her blog and want to toss my computer aside and go make some art, dammit! 2) Deep Muck, Big Rake: I have been a fan of Becky’s since I started waaay back (in March 2008). She reviews books, she’s a journalist, she lives in Florida (like me), she’s a mom (also like me), and she get’s it. 3) Dirt & Noise: I check in with Ilina almost everyday. A hysterical, neat freak, democrat mother of two boys… yup, she’s got a lot to say (and she had a hellish day today so I hope this might help some). Go check her out, you’ll become a regular. 4) The Lil’ Mommy That Could: A stay at home mom with a great sense of humor and way of saying things. Susan does crafts with her kids and blogs about the trials and tribulations of it all. She also started out when I did – power to the newbies! 5) Down to Earth Mama: Another new blogger but DTEMama likes to (as she puts it) practice the “Let’s get Real” approach to life. She is new, she is a mom, she is smart and she has a great deal to say. 6) Tropic of Mom, Life at Lattitude 26: This is another newly blogging Florida mom whom I relate to and laugh with. 7) Wineonthekeyboard: Kacey has been blogging since 2006, and has been a mom for much longer than that. She would describe herself as a “boomer blogger” and discusses life AFTER living in the trenches of motherhood, when maybe women can finally find time to be reacquainted with themselves. Enjoy this little award, from me to you all! Secondly, if you haven’t already, PLEASE, gather together all the goodwill you can muster in your heart and read Motherhood Uncensored’s post about Blog the Recession. If this doesn’t go along with my concept of achieving good blogger karma, then I don’t know what else does. And then go get yourself clicking merrily through the blogosphere. In fact, here is what I am gonna do. I am going to take a little blogging break. Yup. And the time I would be spending towards posting and tending to my own blog, I will spend clicking through, commenting, stumbling and twittering other blogs over the next few days. Do it. Help your fellow bloggers bring home the bacon… BLOG THE RECESSION! I am off to do an EXCESSIVE amount of clicking. Ahh! Thank you. My first blogger award! Oh, thanks! That is so sweet of you! I’ll check out the other blogs you have listed. Happy clicking this weekend! Great nominees. And you’re right … Becky “DMBR” rocks! Me?! Gosh. Thank you so much! Not deserved, but thank you! Aww, shucks! Thank you so much! Awww, I am so honored. Really, I am. I’m going to post about this later today so I can pay it forward. Thanks for the support! BlogHer better be on the East Coast next time so we can raise some hell. My posts are up! It was fun finding new bloggers out there to pay it forward…..
I’m halfway through the M list on Kristen’s blog. will there still be a recession by the time I’m done? Darn, I think there will still be a recession after I finish the list. 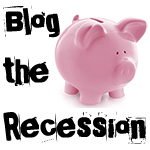 I’m having fun with the Blog the Recession movement. Reading great new blogs, paying it forward & spreading the karma. thank you for visiting and leaving a comment! it’s fun to find new blogs to read.